FLINT, MI — Drive your car down North Saginaw Street through the heart of Flint, Mich., and you won’t see a grocery store for miles. For some that don’t have cars, they may not see a grocery store for days. Though this trend repeats itself in food desert cities across the country, the four-year anniversary of Flint’s water crisis adds a nuance. A food desert combined with a city-wide water crisis has exposed an estimated 100,000 people to lead-tainted water. This underscores the necessity of accessible fresh produce to counter the effects of lead poisoning. Access to fresh produce is cited as a preventative measure against the effects of lead intake resulting in high blood levels, especially in children. In 2015, it was discovered that Flint children had elevated blood lead levels after the state switched Flint’s water source from Detroit to the Flint River in 2014. That same year, the city began losing grocery stores starting with the close of the Pierson Road Kroger. In 2015, the Davison Road Kroger closed, followed by the close of the Meijer on Pierson Road leaving some Flint residents with little options. 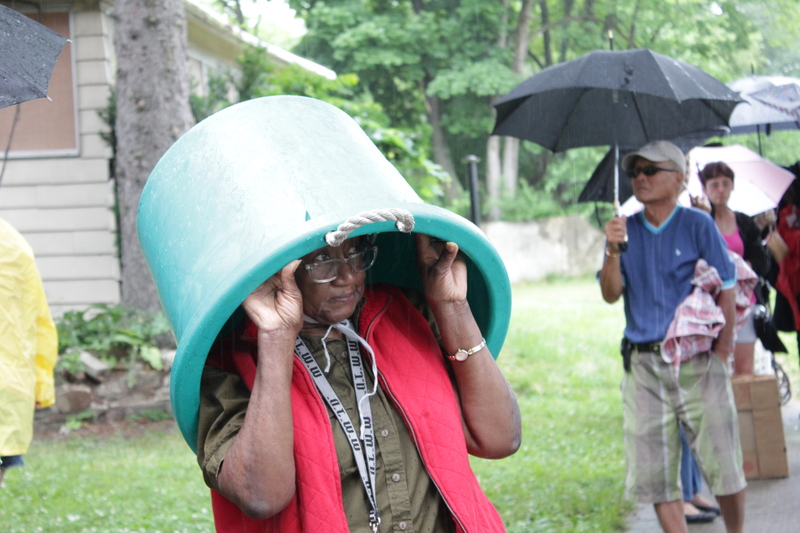 It’s a rainy Wednesday afternoon at Greater Flint Outreach Center and Church on Stevenson Street, and umbrellas spread wide along the sidewalk. Mothers stand with restless children and the elderly shuffle expectantly with walkers and canes. Dorian Swift’s number is 77, meaning he has 76 people in front of him waiting to enter the church to fill their containers with donated food items. Once inside he might find loaves of bread, canned goods, chips, sweets, a few bags of potatoes and oranges, though there’s no guarantee once those in front of him have had their pick. “We be in this line every week and they already know the routine. They pass the numbers out and then they move out of the way so we can get our numbers. Their line get so long and we are still waiting on a number. We need more food places, especially downtown around this area,” said Dorian Swift, 56, as he waits in line at a local church food pantry. People young and old stand with boxes, bins, carts, suitcases, and children in hand sometimes waiting up to two hours or more for food. 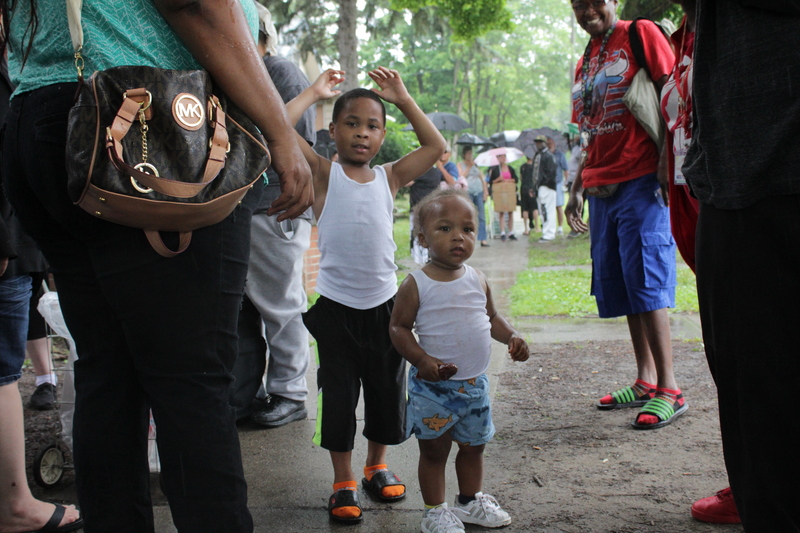 Greater Flint Outreach Center and Church services an average of 3,000 people per month. Just a few blocks away, Prince of Peace Church held their weekly food drive. They offer a weeks-worth of prepackaged bags of beans, vegetables, bread, and milk, but the head organizer of the Prince of Peace food giveaway, Jimmie Thompson, age 60, sees the gap in provisions. “I would like to have some fresh fruit more often than what I have but they don’t send that much fresh fruit. Because there really ain’t no grocery stores around here to get that stuff,” said Thompson. Much of the donated food comes from the Food Bank of Eastern Michigan, but Thompson said he feels that another grocery store would help their food giveaways and service the community. In 2016, the Flint & Genesee Chamber of Commerce in partnership with the state of Michigan, contracted with Streetsense, a third party architectural design and strategy firm based in Maryland, to conduct a market study on the feasibility of a new grocery store to pinpoint access to nutritional foods in North Flint. Their study determined that West Pierson Road would have offered the best location in terms of visibility and market sales. Illustrated drafts of a proposed store show a birds-eye view of a grocery store with a combined clinic, aquaponics center, and a neighboring multifamily residential facility. The grocery store, clinic, and aquaponics center would have spanned an approximate 59,500 square feet in total. The total development costs in establishing a national grocery store would have been a potential $14.1 million compared to the projected $8.1 million needed to build a regional store. Streetsense also estimated a national store would have created a total of 168 permanent jobs, 94 more than what would have been offered by a regional store. With this new approach, the Chamber moved forward with an auditing process that allowed for $590,000 to go towards Streetsense’s recommended improvements for pre-existing stores in North Flint. From store expansion, better internal lighting, product reorganization, parking lot construction to new signage, carts, and ceiling tiles, viable stores that complied, received the money for renovations. Hutchinson’s, Mr. B’s Foodland, Landmark Food and Drug, and Local Grocer were the initial applicants, but only three of the four were able to follow the grant conditions—conditions that will come to an end this summer. Some residents say the local grocery stores lack competitive pricing and options. The market study also revealed additional prospects to build two new grocery stores in the region. This task has been left to community leaders like Pastor Reginald Flynn, president of North Flint Reinvestment Corporation, and Pastor Patrick Sanders, chair of Fresh Start Initiative. Despite the difference in strategy, Sanders said he feels that he and the Chamber have the same vision for North Flint. Sanders said he began responding to community calls in 2014 for a grocery store for North Flint, two years before the Chamber’s market study was done. “It took several years just to get people to see that there was a need. And then of course the Chamber came to do the market study to support it and give some legs to it, and we’ve been on this journey ever since,” said Sanders. Sanders recalls after the market study was done, more support and conversation was garnered for the grocery store initiative. The Chamber allotted both Sanders and Flynn $40,000 to complete their own feasibility studies and architectural mock-ups. Sanders said he considered it a “good start.” Since then he has forged support from Tide Foundation and Michigan Good Food Fund. The only obstacles he says that are standing in his way are a few missing parcels of land that he hopes to procure before his big announcement this coming fall, but he is hesitant to name specifics like dates and location. Sanders is not the only one facing challenges in opening a grocery store in North Flint. Flint Beat could not reach Flynn for comment. 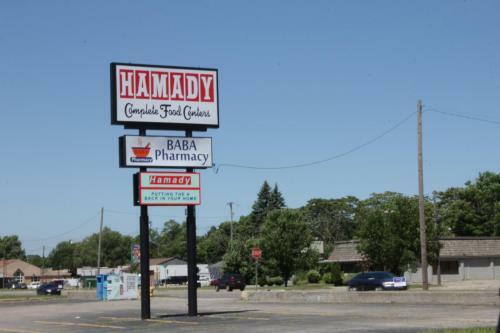 There has been long-held anticipation for Hamady Complete Food Center to open in the old Kroger location at 2629 West Pierson Rd. Reports of the store’s development began winter of 2016. A six to eight-month plan grew into a nearly two-year-long project. “With the grace of God, and everything falling in place with the city, the store should open July 18,” said Hamady Complete Food Center owner, Jim McColgan in an interview July 3, 2018. The store has had a number of proposed grand opening dates, but they were postponed due to setbacks including an absence of construction permits, city inspections and lack of employees. In July alone, Hamady officials have rescheduled their grand opening at least twice. McColgan says the store is in its concluding stages of stocking shelves, license approvals, and city inspections. The store is now set to open on July 24, 2018. First posted on Black News Portal July 2018.